Learning about animal habitats has never been so much fun! 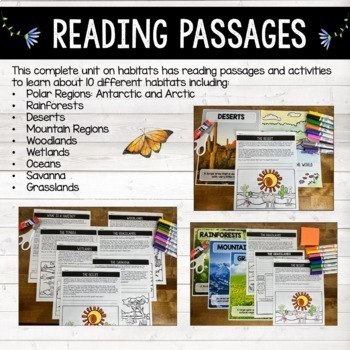 In this pack you'll find 10 passages with scenes for students to color and connect to the information and custom organizers for each habitat. There are also colorful vocabulary photo posters and writing activities too! Your students will love learning all about these 10 unique habitats with informative and fun pack! 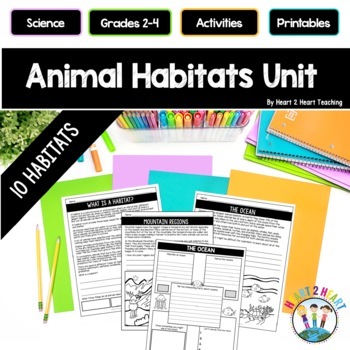 This pack includes an introduction to 10 different habitats with informational articles, vocabulary posters, and a variety of hands-on student activities. 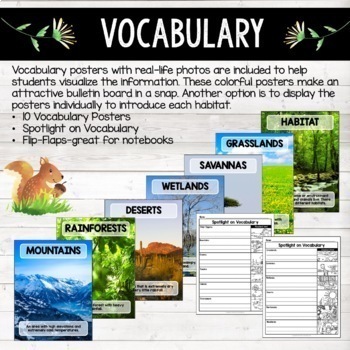 Introduce the vocabulary words with the real-life photo posters included. You could post these posters around the classroom and have students travel around to match up and define the words in their flip flaps or use as a center activity. These posters make an excellent bulletin board display in a snap! Next, have students read the informational articles about the different habitats. The articles are written with questions and scenes for students to connect and color. Pages can be stapled at the top to make one large booklet or be cut in half to create a mini-booklet. *Which Habitat Would You Want to Live? -- drawing and prediction activity. 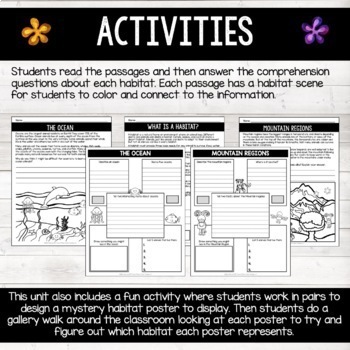 *Habitats Research Organizers (10): Have students work individually or with partners to research one habitat and complete the organizers included. Then they could present it to the class or to use the organizers as study guides. *Habitats Mystery Flaps Activity: Have students cut out flaps and glue inside their Science notebooks. Next, color the animal on the front and decide where that animal belongs? Which habitat would you find that animal? Underneath the flap, tell the habitat and why you think that animal belongs there. ► Rainforest - Animal Habitats & Layers of the Rainforest - 140 pages! Subscribe to our NEWSLETTER to gain excess to our FREE Library of Classroom Resources, special giveaways, and to see our products in action! Please know I spend a lot of time researching, creating, writing, and proofreading my work but even after several revisions there may still be a typo or grammatical error. Please let me know if you find a typo or feel that a correction is needed. Just click on the Ask a Question section or email me at heart2heartteaching@gmail.com versus leaving negative feedback so that I can fix it as soon as possible. I value your input to make my products the highest quality possible. Thank you in advance for your help and support!